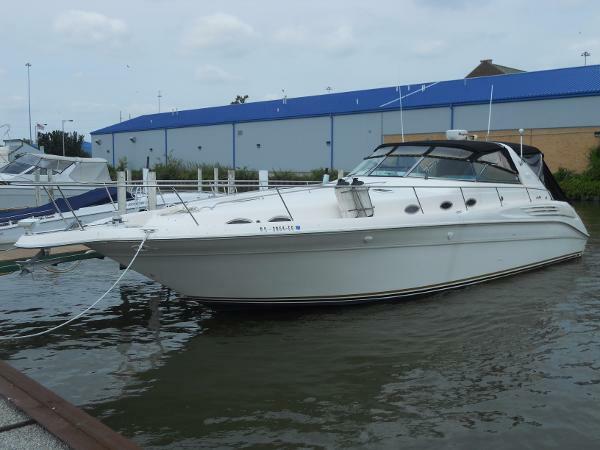 1995 Sea Ray 450 Sundancer Low Hour, Nicely appointed Former Fresh Water 450 Sundancer with Two Stateroom / Two Head Layout, with a Great Cockpit for Entertaining. Twin 420hp Cummins Turbo Diesels.Air Conditioning, Generator, Full Electronics Package, Camper Canvas, Extended Swim Platform and more. 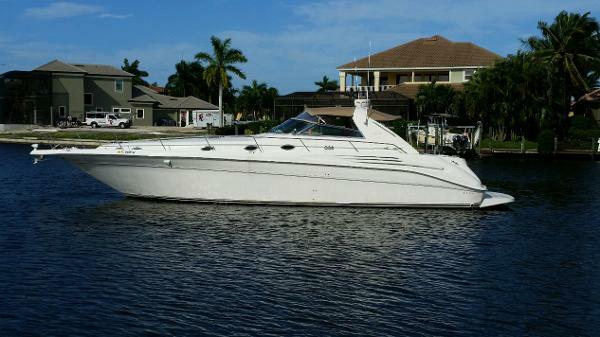 1998 Sea Ray 450 Sundancer Breakin Rules is a 1998 Sea Ray 450 Sundancer. 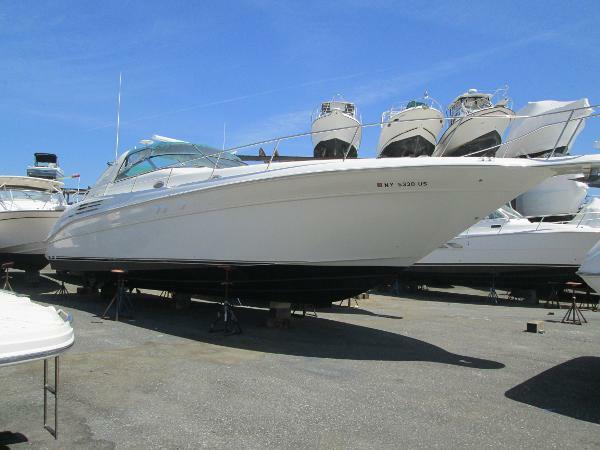 She has been meticulously maintained by her long time owner. The owner of this boat is an experienced yachtsman and pilot and the care and pride of ownership shows at every turn of a knob. CAT has been out to service the engines and they are completely up to date in every way! Fast, sleek, and very modern in design this boat offers comfortable accommodations for four adults plus a couple kids. Her huge outside deck space provides great lounge areas for cocktails or family meals or games. 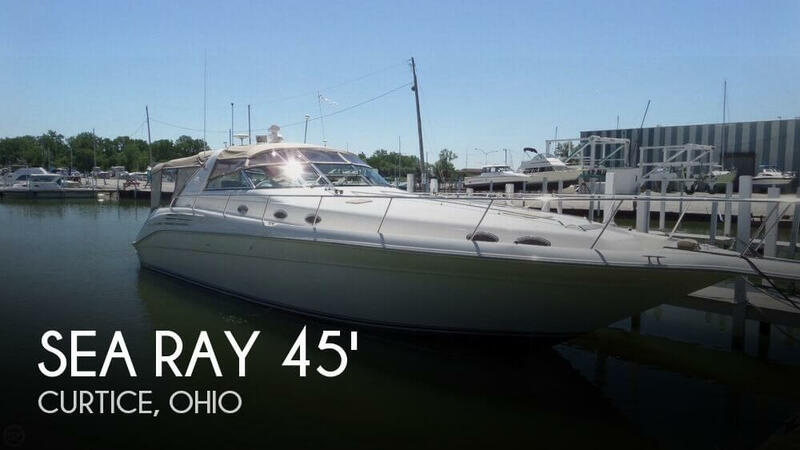 Please come and see why Sea Ray has been a leader for years in this segment. 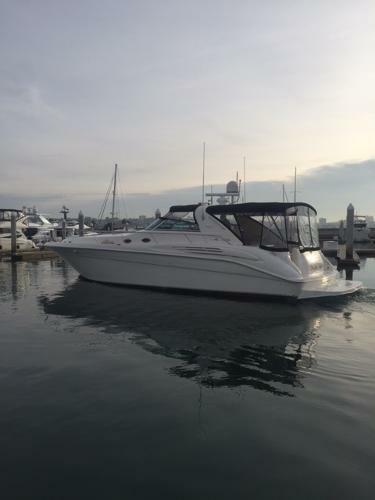 Call now for an appointment to see her here at our office in San Diego, slip is transferable to qualified buyers. 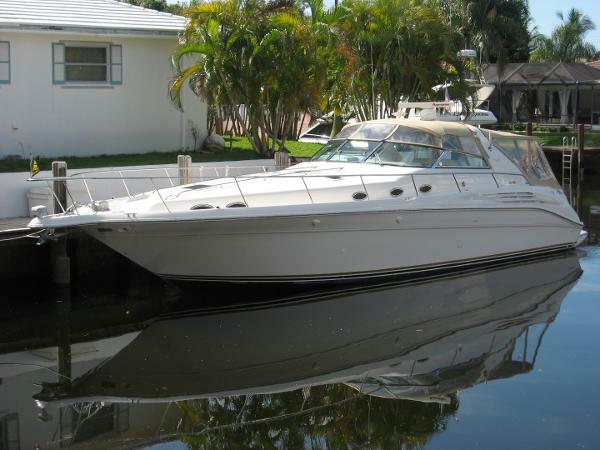 1998 Sea Ray 450 Sundancer Just reduced !, This top quality sport yacht has just 620 hrs on Caterpillar 3208 motors / 435 HP. Have a look at the pictures. She's in top condition and will go out washed/waxed bottom painted and survey ready. Call asap to make an appointment for a showing. 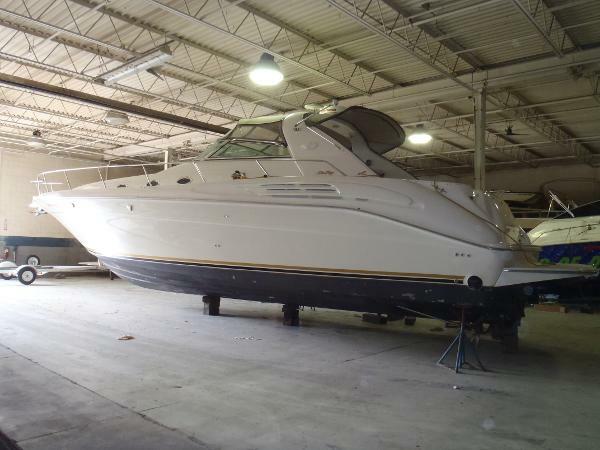 1995 Sea Ray 450 Sundancer 1995 Sea Ray 450 Sundancer WELL KEPT, RUNS GREAT 450 DA - GREAT LOOKING AND WELL LAID OUT CABIN This 450 DA with TWIN CAT 3116TA'S have only 890 hours! She has 2 private cabins both with their own heads with stand up showers. This boat has all the right amenities Westerbeke Generator, 2 AC/Heat units (in cockpit too), Windlass Anchor, ACR Search Light on Bow (great feature), Raytheon Ray Pilot 650 Auto Pilot, The owners have indoor heated stored her for years. 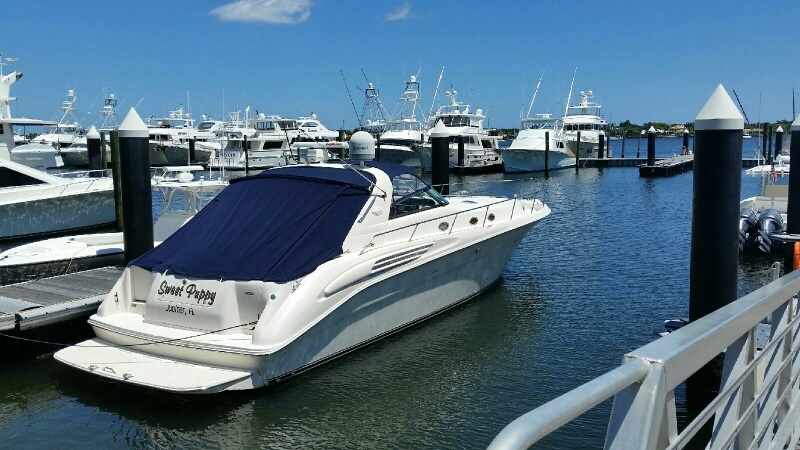 Well maintained boat with super nice looking cabin with the following new for 2016; new cockpit upholstery and vinyl plank "wood" flooring in cabin, 2015: Garmin GPS 7212 Touchscreen, Garmin24x HD GMR Radome, LED Lighted Cupholders, All New Dash Panels and switches and LED underwater lights, Fusion Stereo w BlueTooth and linked through GPS, all new hoses on engines, new SS shafts, and dripless shaft seals. Also, 2 newer side by side fridge/freezers, newer carpet in cockpit and 2 newer Flat Screens!Full camper top and slant/drop top, Ice Maker and much much more!! 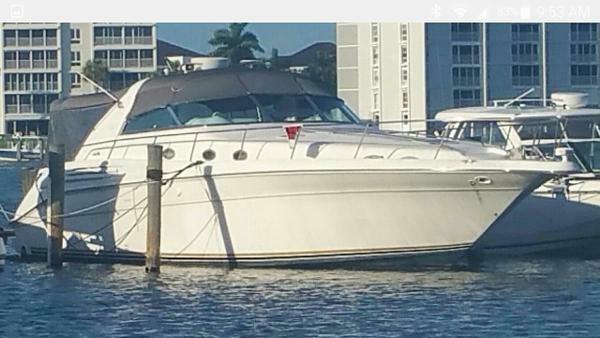 You must see this boat, great for those wanting to upgrade to a larger Cruiser/Motor Yacht. Call today to take a look! 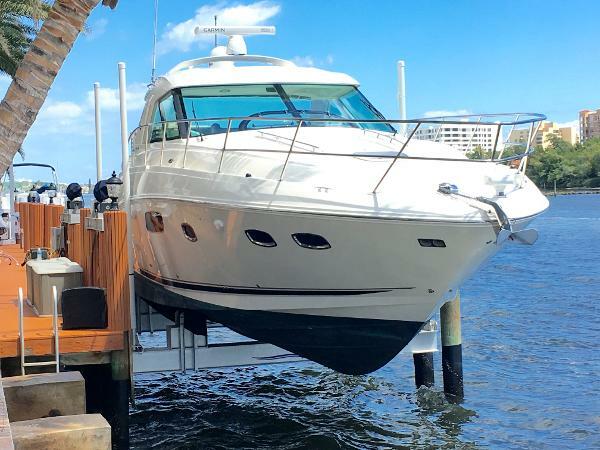 1996 Sea Ray 450 Sundancer 1996 Sea Ray Sundancer for sale completed 2017 restored with 2000 hours on caterpillar 3208 diesel engines with new servious, New canvas , new capareting, new ac 16000 BTU AC , new bottom painted and driples shafts, updated helm panel , new sending units and gauges , new refrigeration, ice machine , interior very clean , new water pumps and bilge pumps , updated generator with new pumps and service . Must be seen to much to list . 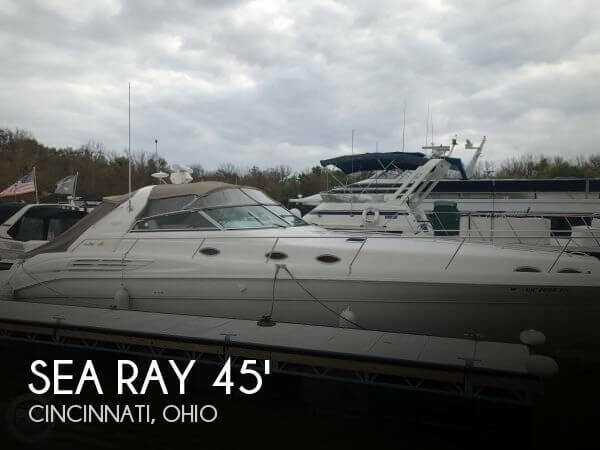 1996 Sea Ray 450 Sundancer The Sea Ray 450 Sundancer is custom designed and built for yachtsmen who enjoy serious cruising in unabashed comfort. 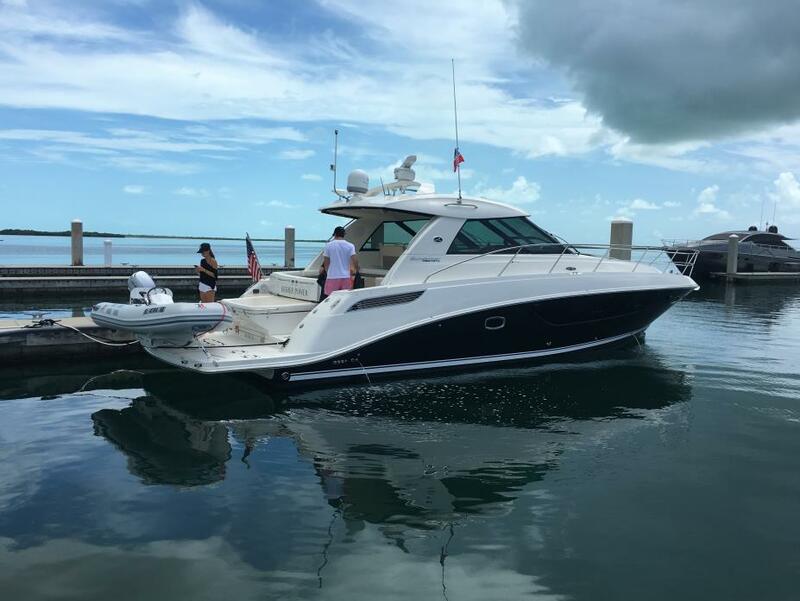 She has the characteristic accommodations of the Sundancer layout and the long-range performance of twin 420-hp Caterpillar engines. The custom slide - swivel captain's chair has an adjacent Euro-styled companion seat. Standard accessory package includes an oil changer system, telephone inlet with cord, vacuum system, and ACR remote-controlled spotlight. The cockpit provides wonderful space for relaxing, with a spacious circular aft-facing seat, U-shaped seating, and Euro cockpit tables that convert to a sunpad. The aft sunpad turns into a useful chart table. 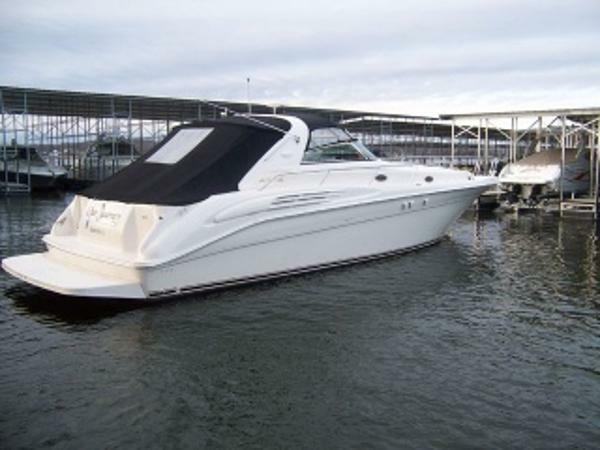 If water toys are a part of the game plan, the 450 Sundancer has plenty of room for storing them. The oversize integral swim platform is large enough to hold a personal watercraft, while the aft wall fender storage neatly organizes docking equipment. The standard Lofrans Progress I rope - chain windlass makes anchoring easy. 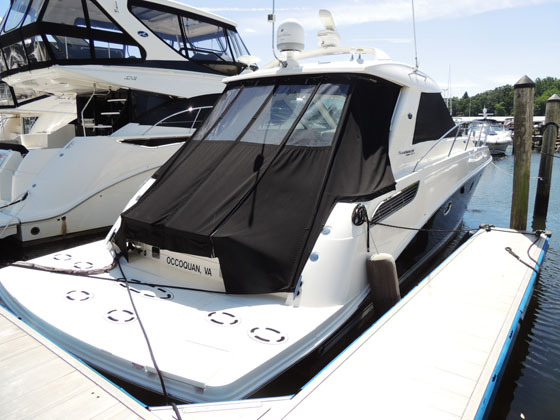 Four lockable translucent deck hatches with screen covers, sliding windows and ten opening port lights provide natural light and fresh air throughout the cabin on mild days. Other days, you may opt to run the central heating or air conditioning. Belowdecks deep-pile marine carpet lines a spacious interior. In the salon, a sleeper sofa, hi-lo dining table, and entertainment center provide respite from the activity topsides. Amidships, the Sundancer berth functions as a conversation area by day and, by night, sleeping quarters for two in the double berth. There's also a cedar-lined hanging locker, vanity with drawers, and space for a TV - VCR - radio. The midships guest head has a VacuFlush toilet, vanity with sink, and fiberglass shower stall with curtain. The private master stateroom has a full-size bed with storage underneath, three cedar-lined hanging lockers with mirrored doors, vanity, pocket privacy door, and an entertainment center with TV - VCR - radio combination. The master head features a VacuFlush toilet, vanity with sink and mirrored medicine cabinet, and fiberglass shower stall with circular acrylic door. It's accessible from the salon or master stateroom. Faux-granite countertops highlight the full galley, with refrigerator - freezer, three-burner electric stove, and microwave. The galley convenience package includes a coffeemaker and blender. 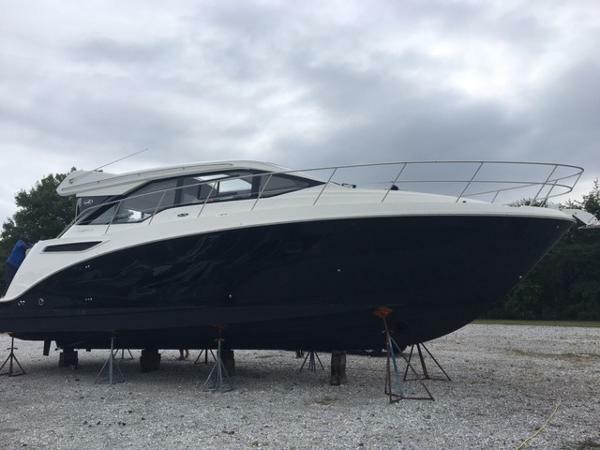 2017 Sea Ray 450 Sundancer Call today to schedule a test ride on this all-new model from Sea Ray! We take trades!